If you’re like us, you’re probably trying to get as much vitamin D this summer that you possibly can. If you didn’t know, sunlight gives the human body the ability to stimulate vitamin D production. It’s startling to find out that an estimated 50% of Americans are deficient in this vital life booster. This means you or someone in your family may be deficient. Vitamin D deficiency is a major predisposing factor in at least 17 varieties of cancer, as well as heart disease, stroke, hypertension, autoimmune disease, type 2 diabetes, depression, birth defects, and infectious disease. I was at a party this past 4th of July and a woman standing next to me pointed out a dessert she had made. With a twinkle in her eye she said "It's fat free and sugar free." I sarcastically thought to myself, yum and then I realized - some people still don't know. Fat still has a stigma attached to it which evident when shopping for full-fat yogurt. Good luck finding a yogurt that isn’t low-fat or fat-free. This is a shame because full-fat yogurt tastes better and is actually better for you. Much of this is driven by the major food companies’ vested interest in fat-free options. They don’t want you to know the truth. Here’s the truth – ever since the low fat craze in the 80s, Americans have gotten fatter and unhealthier. As it turns out, fat does not make you fat but actually improves body composition, especially when eating a whole food diet. In fact, our bodies need healthy fat. Completely avoiding it can be detrimental to our health. Fat is very nutrient-dense, it’s the building block of our cells and hormones, and it allows our bodies to absorb more antioxidants and other nutrients from our food. Fat-soluble vitamins like A, D and E need to be eaten with fat in order for your body to synthesize it properly. This is why many multivitamins recommend taking it with a meal. That means every time you eat a salad with fat-free dressing, you’re not taking full advantage of all the nutrients in the salad! Same goes for green smoothies – if you load it full of fruit and spinach but avoid fat, you’re missing out. If you juice or supplement with a greens food powder like ēRaw, I recommend you add a healthy fat with it. If you’re blending it, add some avocado. If you’re making it in a shaker, add coconut milk, coconut oil or MCT oil like IGNITE. I’m surprised by how many people just use water and miss out on the opportunity to get all the vital nutrients that need fat for absorption. Fat also allows for food to digest slower so you stay full longer and it reduces insulin spikes, which can cause health issues over time. If you’re drinking a smoothie, and you’re hungry an hour later, it might be that you’re missing some fat or protein. Plus, fat makes everything taste way better! Broccoli with butter or broccoli without butter? Hmmmm. Here are several healthy fats you want to include in your diet. Coconut oil is nature’s richest source of healthy medium-chain triglycerides (MCTs). MCTs: - are easily digested, thus putting less strain on your digestive system. This is especially important for those with digestive or metabolic concerns. - strengthen and support our immune system - are sent directly to your liver, where they are immediately converted into energy rather than being stored as fat. - in coconut oil can actually help stimulate your body’s metabolism, leading to weight loss. Avocados, which are actually classified as a fruit, are rich in monounsaturated fat that is easily burned for energy. They also provide close to 20 essential health-boosting nutrients. Previous research has found that avocados can help optimize cholesterol levels within as little as one week; contains compounds that appear to inhibit and destroy oral cancer cells, and those that protect against liver damage. They’re also very low in fructose and have anti-inflammatory properties. Avocados are one of the safest fruits you can buy conventionally-grown, and most experts do not believe you need to purchase organic ones. Butter and Ghee I’m referring to real butter, not margarine and low-fat, low-cholesterol “spreads” since these often contain the unhealthy trans fats that should be avoided. Butter contains omega-3’s, conjugated linoleic acid (CLA), beta-carotene Vitamin A, K, D, and E and even antioxidants. CLA stimulates thermogenesis, or the burning of calories by raising body temperature. This is one of the reasons why healthy fats don’t make you fat, and instead may help you burn fat. Butter also contains an anti-inflammatory fatty acid called butyrate. It's a great option for cooking because it's stable enough to resist heat-induced damage. Butter has even made a recent appearance on the cover of Time magazine where it announced “Eat Butter”. I recommend butter from grass-fed cows like KerryGold which is higher in the nutrients mentioned above. Even if you’re intolerant to dairy, you may do well with butter since most of the proteins found in milk that often cause problems have been removed. If butter doesn’t work well with you, try ghee which is clarified butter, with all of the proteins completely removed. Now, this doesn't mean you can eat all the fat-laden junk food you can imagine. What it does mean is that you don't have to be afraid of enjoying healthy fat. In fact, if you can find some full-fat yogurt, go for it! Just be sure to eat more fruits, vegetables, and properly-raised meats as well. Fats to Avoid Avoid all types of fat that contain industrial and polyunsaturated oils. This includes soybean and other seed oils like corn, canola, sunflower, safflower, and grapeseed oil along with shortening, margarine, low-fat, low-cholesterol “spreads” or anything with “partially hydrogenated” in the ingredients list. What are your thoughts on fat? I'd love to hear from you. I spent years looking into this when I was developing one of the product lines for evolved Natural Solutions. And supplements can be a waste of money, if you’re not sure why you’re taking them. Some Supplements Really Can Make a Difference Research in the British Journal of Psychiatry shows that providing fish oil and a multivitamin to prison inmates reduces aggressive and violent behavior by 35% and decreases antisocial behavior by 26%. In another study, giving children fish oil and a multivitamin improved both their behavior and intelligence scores. Start with a great Multivitamin/Mineral It’s always better to get your nutrition from whole real food first. But that’s not always possible. Also consider… • The progressive depletion of the nutritional quality of our soil, which is supposed to feed our food. For example, one study in the Journal of Nutrition and Health found copper levels have dropped by 90% in dairy, 55% in meat, and 76% in vegetables! • Chronic stress in our lives is higher than ever before • Nutrition is stripped from a majority of the processed food we eat • The food we purchase from the grocery story is often time 2 weeks old. The longer that a fruit/veggie has been harvested, the more nutrition it loses. A study at Penn State University found that spinach lost 47% of its folate after just 8 days. • Out-of-season vegetables may have more than half the nutrients found in in-season vegetables • Research reveals that most diets are now so micronutrient deficient that they require on average 27,575 calories to supply all the essential nutrients that you need! At minimum, I would recommend a good whole food multivitamin/mineral for everyone just to cover all your micronutrient bases. Besides a daily multivitamin, when else should you consider supplementing? 1. Look at other core nutritional gaps you might have, especially in the realm of macronutrients (healthy fats, high quality protein, whole food carbs and fiber). Dialing in on these will help you optimize body composition (muscle vs fat) and overall well-being. • If you’re not eating high omega-3 healthy fats from oily fleshed, cold water fish such as wild Alaskan salmon, mackerel, sardines, herring and black cod, take a fish oil supplement. I take fish oil on days I don’t eat fish. • On days you didn’t get enough greens in like kale and spinach, consider using an organic greens powder. • If you’re not getting sufficient sun, take a vitamin D and K supplement. On days I don’t plan on getting much sun, I supplement in the morning. BTW, 70% of the population has inadequate vitamin D levels. • If you’re not getting adequate levels of high-quality protein for muscle building and maintenance, add a high-quality protein powder. • If you don’t use a lot of herbs and spices or drink green tea, consider a phytonutrient supplement. • If you don't eat fermented food like sauerkraut, kimchi, or yogurt, consider taking probiotics. We offer a free Core Health Assessment to determine nutritional gaps in your diet. Take it here. 2. Next, consider health concerns and health optimization. Supplements carry much less risk than prescriptions so you may want to talk to your doctor about more natural alternatives before resorting to a prescription. There are many supplements that can address health-specific issues. Before you take any supplement, know what your intended goal is and really determine your best option. 3. Use supplements to gain a competitive edge and increase progression in performance goals (mental and physical). For example, if you’re looking to build muscle and improve post-work-out recover, consider a protein powder. If you want to boost stamina so you won’t fade in the middle of a high-intensity workout, consider D-Ribose. We have an entire line of sports specific supplements that are guaranteed free of banned substances. Check out our Klean Athlete line here. What supplements do you currently take? What's your biggest confusion around supplements? Food Synergy You will probably never hear this from a supplement company, but getting your nutrients from food is much better than getting it from supplements. Why is real food better? One reason is something called food synergy. Food synergy enables all the macro- and micronutrients found in food to be utilized by the body to their fullest extent or combing different foods to increase nutrient absorption. You’re literally getting more out of your food than you normally would. An example of food synergy is tomatoes and olive oil. Lycopene, found in red vegetables and fruits like tomatoes, may be help to prevent heart disease, atherosclerosis and even breast and prostate cancers. It may also be the most powerful carotenoid against singlet oxygen, a highly reactive oxygen molecule and a primary cause of premature skin aging. When you add olive oil to tomatoes, the oil’s healthy fats enhance the amount of the lycopene that your body can store and absorb, providing a combination that’s bursting with flavor and health benefits. Another example of food synergy is sprinkling cinnamon on your coffee instead of sugar. This will not only boost the flavor, but it will also help keep your blood sugar at a healthier level preventing energy dips and spikes in your hunger level. A study published in the American Journal of Clinical Nutrition revealed that cinnamon was found to slow the rate of stomach emptying after meals and reduce the rise in blood sugar after meals to negate more binging later. The opposite can also occur. Tannins found in coffee and tea can prevent absorption of calcium so stay away from them at least 30 minutes after eating calcium-rich food like greens. Another example is vitamins D and K. Vitamin K2 protects against Vitamin D toxicity, and vice versa and they both work together to shuttle calcium into the bones rather than allowing calcium to build up and harden in the arteries. This is exactly why we combined vitamins D and K in our Liquid D&K. Many antioxidants have a synergistic effect on each other as well. When supplementing, it’s best to take a wide range of these nutrients and botanicals in moderate doses rather than very high doses of any one of them. Below are some science-based examples of antioxidant synergy, all of which were used to develop our ēOxidant formulas. It is very possible that there are synergistic effects between multiple antioxidants that science hasn’t yet discovered. • Alpha-lipoic acid (ALA) and acetyl-L-carnitine: These compounds work synergistically to restore mitochondrial integrity, help direct energy to the cells and fight memory loss. • Astaxanthin, CoQ10 and alpha-linolenic acid: Alpha-linolenic acid is a fatty acid that helps maximize absorption of astaxanthin, CoQ10 and other fat-soluble antioxidants in ēOxidant. * • Green tea has synergistic effects with key components of turmeric, increasing cell protective activity. • Rosemary extracts have shown to work synergistically with lycopene in protecting against free radical damage to good LDL cholesterol. • Astaxanthin and resveratrol have been shown to help absorption of other micro- and macro-nutrients derived from herbs. Evidence suggests that higher consumption of chocolate is associated with lower levels of total fat (fat deposited all over the body) and abdominal fat, independently of regular physical activity and diet, among other factors (1). Chocolate is rich in flavonoids, especially catechins – which have important antioxidant and anti-inflammatory properties. Chocolate also produces higher levels of physical energy and mental alertness while, lowering blood pressure in women. It may even block feelings of pain and anxiety (2)! One-and-a-half ounces of dark chocolate a day for 2 weeks has been linked to a reduction in stress hormone levels (3). Matcha green tea is the most nutrient-rich type of green tea. It is 10 times higher in antioxidants than traditional green tea. In addition to providing trace minerals and vitamins (A, B-complex, C, E, and K), matcha is a potent source of unique catechin polyphenols which have anti-aging and DNA protecting qualities. A 1999 University of Indiana School of Medicine study showed green tea supports DNA integrity and decreases free radical generation. The polyphenols found in green tea also reduce harmful HDL cholesterol in the blood, protect against oxidative damage to helpful LDL cholesterol, stabilize blood sugar levels, help reduce high blood pressure and enhance the resistance of the body to many toxins. The most important polyphenol in green tea is Epigallocatechin gallate (EGCG). One study indicates that EGCG is 25-100 times more potent than antioxidant vitamins C and E.
Studies have shown that green tea polyphenol compounds may inhibit cancer, help prevent cardiovascular disease, help boost immunity, and slow the aging process. Green tea is synergistic with key components of turmeric, further increasing cell protective activity. You can also find matcha green tea in our eOxidant Botanical Extracts formula. The antioxidant content within turmeric comes from active compounds called curcuminoids. Curcumin protects against both water- and fat-soluble free radicals. It enhances the body’s level of antioxidant compound such as glutathione, promoting the proper detoxification of cancer-causing compound by the liver. Turmeric is also recognized as an adaptogen, helping to support your body against stress and providing immune system support. You can also find turmeric in our eOxidant Botanical Extracts formula. TURMERIC BERRY PROTEIN SMOOTHIE I recently made this smoothie and it was delicious! It has a slight turmeric taste but it's not overbearing. The fruit eliminates the strong bitterness usually associated with turmeric. AND I wasn't hungry for five hours after! Plus, it's kid approved. My kids loved it. Probiotics (beneficial gut bacteria) are the hottest term in the supplement industry right now. Rightfully so – they control many aspects of health as I discussed in a previous post. But there’s a lot more to the story then just popping a few capsules of probiotics. Probiotics have to be “fed” in order to survive. That’s where prebiotics come in. Prebiotics are indigestible food ingredients that stimulate the growth and maintenance of our beneficial gut flora. Properly feeding the good bacteria may prevent bad bacterial overgrowth, resulting in improved health. Recent research by academic and industry experts suggests that supplementing with or consuming prebiotic-rich food may be more important than taking probiotics. There are 2 known forms of prebiotics: soluble fiber and resistant starch. Soluble Fiber Soluble fiber is indigestible by humans but serves as a great form of prebiotics. Some forms of soluble fiber are inulin and oligofructose, along with fructooligosaccharides (FOS), galactooligosaccharides (GOS), other oligosaccharides and pectin. Fresh fruits and vegetables are a great source of soluble fiber as well. Resistant Starch Emerging evidence has revealed that resistant starch may be a great way to get prebiotics into our diet. Starchy vegetables and fruits (such as bananas) are good sources. Surprisingly, white potatoes and white rice that have been cooked and cooled, are also high in RS. You can try incorporating hard-boiled or converted rice like Uncle Ben’s original which tends to be higher in RS then other forms of rice. Potato starch is another inexpensive and easy to use option. One tablespoon contains about 8 grams of RS. It’s mixes easily and doesn’t have much of a taste. Start with 1 tablespoons of potato starch in yogurt or a smoothie and increase up to 4 tablespoons a day. You may experience some gas in the beginning but this will subside as your gut biome becomes healthier. We recommend this brand of potato starch. Benefits may be seen from as little as 6-12 grams/day of RS, but closer to 20 grams/day might be ideal. Potential effects of increasing RS include reduction in appetite, weight loss, lowered fasted blood glucose, and even lucid dreams! If you decide to supplement with probiotics, ensure it has some type of prebiotic as well. When we developed eWhey, we included several forms of prebiotics to further enhance its healthfulness. Feed your healthy gut bacteria for a month and see if you notice a difference. When searching for a protein supplement, it's important to consider the following four "pillars" to ensure you're getting the highest quality and most bio-available protein possible. The Highest Biological Value (BV) Protein is measured with a Biological Value (BV) which refers to how well and how quickly your body uses the protein that you consume. The higher the BV of the protein, the more nitrogen your body can absorb, use, and retain, promoting the most lean muscle gains. Whey protein has the highest BV with a value of 104, while soy protein is at a distant 74. Beef, eggs, and fish also measure high, though not as high as whey. Plant-based proteins are measured much lower, so it's optimal to get your protein from an animal source. Whey protein is rich in the amino acids critical for developing and sustaining new muscle mass. It contains every essential amino acid, plus some of the non-essential ones, making it a complete protein. In fact, whey provides more Branch Chain Amino Acids (BCAAs) than any other protein source. The BCAAs are leucine (mentioned above), valine and isoleucine. These make up one third of the amino acid profile of your muscles. The BCAAs’ most important job is to assist in synthesizing other amino acids that muscle building requires, including glutamine. Whey supports your immune system by raising levels of glutathione – a tiny molecule that’s found in every cell as its ‘master’ antioxidant and detoxifier. It is one of your body’s best-kept secrets in the war against free radicals and the normal signs of aging. 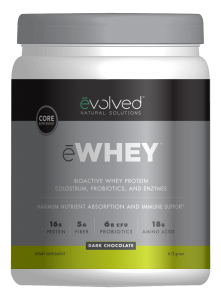 eWhey Organic Protein is cold-processed ensuring the highest BV. It’s digested so rapidly that it increases the refueling speed of your muscles during that critical time just following your workout. Organic & Pasture-Raised If you do choose to go with an animal source for your protein, it's best to choose grass-fed animals which are higher in essential fatty acids such as CLA (conjugated linoleic acids) and lipolic acid. They typically have three to five times more CLA than grain-fed animals. CLA supports healthy body composition levels. Free-grazing cows are humanely raised and will never see the inside of a feedlot. Compare that to where your typical whey protein comes from; CAFO (Concentrated Animal Feeding Operations) are generally raised in filthy, crowded conditions. CAFO cows are typically feed GMO grain diets (especially corn) which create a much higher level of acidity in the animal’s stomach, leading to many health problems. Organic ensures the whey is derived from cows that have access to natural pastures not treated with pesticides, fertilizers, genetically modified (GM) ingredients or other harmful chemicals. The cows are never treated with antibiotics or growth hormones such as rBGH/rBST. Studies have shown that synthetic growth hormones used to increase milk production in non-organic dairy cows may be carcinogenic and can also be linked to early onset of puberty in preteen girls. A four-year long, $25-million EU study into organic food, the largest of its kind to date, found that milk from organic herds contained up to 90 percent more antioxidants. Cold-Processed and Non-Denatured Cold-processing leaves the protein unaltered (non-denatured) by heat, chemicals, or enzyme action which ensures all the natural qualities are unchanged. As mentioned above, cold-processing retains the maximum BV of all the key amino acids, protein fractions and beneficial micronutrients present and intact, promoting a healthy immune function and healthy flora balance. Don't be fooled by the term "undenatured" - it is not possible for a protein to be undenatured. Once a protein is denatured, it cannot be refolded. Concentrate (Not Isolate) This is the least processed form of whey, so it contains the most beneficial compounds and a complete spectrum of amino acids (including BCAAs) and immuno-supportive nutrients. ēWhey™ still contains the vital protein-bound fats naturally present in raw milk and is assimilated by your body much easier than any protein isolates. Protein isolates are acid/ion exchange processed protein which denatures the amino acid profiles by using acids and chemicals to separate the whey from the fats. Protein isolates are deficient in key amino acids and nutritional cofactors. Quality whey like ēWhey, provides all the key amino acids for glutathione production (cysteine, glycine and glutamate) and contains a unique cysteine residue (glutamylcysteine) that is highly bioactive in its affinity for converting to glutathione. Protein is especially important for healthy aging. Protein requirements for the elderly may be higher than that suggest for a young adult. This higher requirement may derive from a lower efficiency of protein utilization in advanced age, despite the associated decrease in muscle mass. Failure to meet these increased protein needs may negatively affect an individual’s immune-competence and recovery from medical complications. Additionally, the lack of adequate protein intake as we age, can actually encourage overall muscle deterioration and the loss of bone density, especially in the hip and spine areas. As you age, your body gradually loses its ability to produce critical amino acids, the essential proteins you need for energy production, immune actions and protein buildup in the muscle. Therefore, the need to supplement with these amino acids increases as you get older and increases even more in times of high physical stress, like after a workout, or when recovering from injury or illness. A protein supplement isn’t just for athletic men; many women do not ingest adequate amounts of protein. The common misconception that taking a protein supplement like ēWhey will bulk up a woman is completely false. Women lack the hormones that men have that allow them to get those large bulky muscles. A woman usually gets an overall toned appearance, and will likely lose belly fat in the process. eWhey Organic Protein has some unique benefits in terms of sleep. It’s easily digested, full of essential amino acids for repairing your body, and it contains bioactive milk peptides (BMPs). BMPs are one of the most promising new supplements for improving sleep and reducing stress. BMPs are actually sourced from whey protein, but they’re a lot more expensive after processing. These proteins are most effective in their non-denatured form. Heating and pressurizing them actually reduces their effects, which is why we recommend BMPs from cold-processed whey protein concentrate rather than pill form. The most effective whey protein we’ve tested for improving sleep is eWhey, which also has added colostrum to increase glutathione levels. More glutathione helps your liver remove toxins that interfere with sleep. Recent evidence suggests Vitamin K is an important adjunct to vitamin D, and if you are deficient in one, neither works optimally in your body. Vitamin K2 protects against Vitamin D toxicity, and vice versa. Without the help of vitamin K2, the calcium that your vitamin D so effectively lets in might be working AGAINST you - by building up your coronary arteries rather than your bones. Vitamin K A growing body of literature supports the concept that increased intake of vitamin K both from food as well as supplements can have a beneficial impact on bone health. While the term “vitamin K” may imply a single molecule, vitamin K is actually a group of similar molecular forms including K1 (phylloquinone) and K2 (menaquinone). Liquid D and K has been specially formulated to include the most important molecular forms of vitamin K for optimal health. Vitamin K1 is the most abundant form of vitamin K in the diet and is most often found in green vegetables such as spinach, lettuce and broccoli. Often this source of vitamin K is difficult to obtain in sufficient amounts from the diet, as the molecule can be bound tightly to the chloroplast membrane in the plant. Vitamin K1 is well regarded for the important roles it plays in the body’s normal blood clotting mechanisms Vitamin K2 is not commonly found in the diet; as only a few products including meats and certain fermented foods provide this relatively rare form of the vitamin. Vitamin K2 is actually comprised of a group of several different molecules, abbreviated as MK-n, where n represents a number. MK-4, found in some animal meats and liver, and MK-7, found in fermented cheeses and soy products (Natto) are two of the most studied forms of vitamin K2. Supplementation with this vitamin is important as most people do not receive enough vitamin K2 from diet alone. Human studies show that vitamin K plays important roles in bone health. Vitamin K has been shown to decrease calcium excretion and is involved in gamma-carboxylation of osteocalcin. Osteocalcin is important for healthy bone formation, as it facilitates the binding of calcium to hydroxyapatite (bone matrix). Additional studies also indicate that vitamin K2 may play important roles in supporting cardiovascular health and normal arterial elasticity. While Vitamin K1 has shown to be useful in some studies, vitamin K2 is thought to have additional, beneficial effects, as the body has a natural preference to accumulate this vitamin in tissues such as bone. MK-7, a natural form of vitamin K2, in particular has shown to have rapid bioavailability in the body and the low dosages required (45 mcg) can be effective for supporting bone health. evolvedNS uses a natural vanilla-flavored liquid delivery system for Liquid D&K ; this makes the vitamins much more bioavailable, sending the nutrients strait into your body. When Vitamin D is in pill form, almost none of the vitamin is absorbed into the body. Both Vitamin D and Vitamin K are fat-soluble vitamins which means they require fat to assimilate in the body. Liquid D and K’s delivery system includes medium-chain triglycerides (MCTs) and sunflower oil, two fats that further increases absorption. 15-30 minutes of sun per day is about what a person needs, but this depends on various factors such as nationality and skin type. To determine if you're getting sufficient sun exposure or need to supplement vitamin D, I recommend getting an inexpensive vitamin D blood test. You’ll want your levels to be above 30ng/ml but there is a lot of research that tends to suggest much higher. There are ideal times to be in the sun so that your body can make vitamin D. Going out sometime from sun-up through noon should be adequate. You can use the app D-Minder to track your Vitamin D levels or go to the Sun or Moon Altitude Table and determine when the sun is 50 degrees or higher in your demographic area. This is the optimal time to get sun for vitamin D purposes. Before putting sunscreen on, consider that "The majority of sunscreens are geared to protect you against burning (UVB) rays, but too many UVA rays and not enough UVB promotes vitamin D breakdown. ", according to Dr. Anastasia Boulais. So put protective clothing on or some broad-spectrum sunscreen on AFTER you get your needed dose of sunshine. It's especially difficult to get adequate vitamin D in the Winter months. We are out in the sun less and the sun's angle in the sky is not ideal for getting the proper rays for vitamin D production in the body. Supplementing with a liquid Vitamin D that contains 1000-5000IU may be your best bet to ensure you're getting the appropriate amount each day, especially during the Winter. Vitamin D3 - The Ideal Form of Vitamin D Vitamin D is well known for the role it plays in helping to regulate calcium and bone metabolism. As we age, vitamin D status declines. If given the same amount of light, a younger person can produce more vitamin D compared with an older individual. When advancing age is combined with northern latitudes, one can quickly become deficient in vitamin D.
Numerous scientists now feel that supplementation with vitamin D (specifically D3 rather than D2) at levels greater than previously thought necessary is critical to helping maintain healthy bone remodeling as we age. There are very simple AND easy hacks that will help you lose fat, remove all of the guess work and also allows for daily "treats" that you'll love. Hack #1: Harness the power of intermittent fasting. This is where you send your fat-burning hormones into overdrive by eating your meals within 6-8 hour window. I'll have an entire post on this in the near future. Hack #2: Enjoy two, super-quick, 60-second fat-burning "milkshake" meals during the day (I'll show you how you can get our Unlimited Whole Food Smoothies & Milkshakes Matrix 100% FREE in just a minute). Hack #3: Eat a balanced dinner of healthy fat, high-quality protein and unprocessed carbohydrates in the early evening. I also drink water and tea throughout the day… and I enjoy a cup of fresh-ground coffee most mornings. Then, one day a week, I take a day "off " and eat regular meals all day. To keep things interesting, I constantly switch up my eWhey milkshake recipes and as mentioned, I'm going to give you the opportunity to get the same recipe matrix I use called Unlimited Whole Food Smoothies & Milkshakes Matrix… for FREE! Just order a 4-pack of eWhey which is currently on sale for $100!